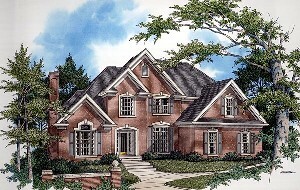 Here is an attractive 2 story traditional style home that truly shows the beauty of brick. The 2,954 sq ft of living space consists of an open floor plan with large a master bedroom suite on the first floor, a large family room with fireplace, and an 18’ high vaulted ceiling front door entry. There are numerous other features to This Cool House Plan that make this home a showplace. To estimate cost, I am selecting wood frame construction with brick veneer (#2 “Quality Class” for exterior Finish), and #4 “Quality Class” for all the other categories. Using this 10 corners foundation shape on the Craftsman Book Company’s cost estimating software for Grand Rapids, MI area, I came up with an approximate total cost of $442,149 or $150 per sq. ft. and an approximate total cost of $391,671 for an owner/builder, or $133 per sq. ft. I determined the owner/builder cost by deducting the General Contractor Markup of $50,478. You should keep in mind that the cost to build for this example, or any house plan, can vary considerably depending quality of materials selected, and on actual bids for labor and materials. Highly decorative, starkly original or exceptionally well-appointed residences will cost more. Until you start getting actual bids and estimates and entering them into your own spreadsheet (see my spreadsheet page for FREE spreadsheets), any cost to build estimates will remain approximate. Anyone can use the free software from Craftsman Book Co. to see how different quality selections will affect cost. For example, changing the siding selection from brick veneer to hardboard or inexpensive stucco reduces the cost considerably. Important Notice: Cost estimates change. YOU can check to see if they have changed by running the Craftsman Book Co. free estimating software yourself. Keep in mind that this 2018 estimate is approximate and is just a guide. It does not include the cost of land or local government fees.